Reading the new Haruhi book is a lot like wearing an old jumper. Don't run off! Let me explain myself. Opening the book, everything feels warm and familiar. Sure, it feels kinda worn in and doesn't fit perfectly, but it's very comforting to come back to something you know well and enjoy. Such was how I felt sitting down to read The Disappearance of Haruhi Suzumiya. After a brief re-introduction to the cast and their various characteristics, Protagonist Kyon (real name unknown) is thrust into another bizarre adventure against his will. This time, Kyon finds himself thrust into a world devoid of Haruhi or any of the other ragtag band of crazies who make up the SOS Brigade after-school club. Kyon goes on a trek to find out what on earth happened and to figure out how, and if, he should fix everything to how it was before. This new story has a welcome improvement from the previous volumes in that all of the strange events of the story directly affect the first-person narrator Kyon. You get to watch his sarcastic outlook get put through the wringer instead of having him relate events that are happening to others, leading to much more engaging prose overall. It provides a welcome change from having the main character be a disaffected observer of bizarre events yet again and allows for some interesting development of his character and motivations throughout the book. The rest of the characters also receive their fair amount of the spotlight, and you learn a little more of the interrelations between them. The plotline, which I am trying to skirt around in case of spoilers, moves along at a reasonable pace and answers all reader questions, but notably stumbles at the climax of the books events. Shortly after the climax, which for me made perfect sense and opened up some exciting possibilities, the author calls the book to the halt so he can clearly spell out the events that occurred just in case you weren't paying attention. This cheapens the ending a great deal, as instead of merely hinting as to the outcome a great big red arrow was instead used to point it out. Kyon further dwells on the climax in the final pages, adding big flashing lights to the sign saying "This is what the ending means, doofus!" I feel I should mention here that the majority of the plot itself is highly engaging and enjoyable, and it is only because the way the climax is handled is such a noticeable drop in quality compared to the rest of the book that I feel the need to bring it up. The characters are still enjoyable to spend time with, the events presented are interesting, and the whole story is an page-turner even when you take into account its errors. There is one further sin the book commits, but that will need a bit of explanation. If you watch anime you may be familiar with characters saying "That Person" instead of using someone’s name as a way of increasing tension in a plotline, or just to draw events out. It is usually used poorly, and sadly Disappearance falls into this trap as well. The first time it happens in the book it is actually used sparingly and to some decent dramatic effect, however it is used again later on across four whole pages when it would have been best to not bother with the gimmick. Given that the reader should have already figured out who the person in question is in this second instance, having so many mentions of "that person" in bold text at such a key point in the story ruins the tension that has been building and left me rolling my eyes. 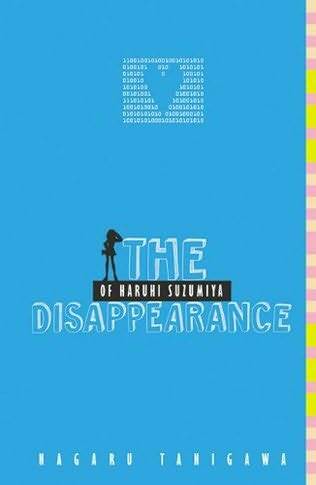 For readers of the previous Haruhi books, Disappearance will feel like a comfortable continuation of the series with nothing truly earth-shattering but a lot to love nonetheless. Those who have not read the previous books may find themselves adrift somewhat as while the prologue does a great job of catching you up on the principle characters and setting, the story proper draws on a lot of elements expanded on in previous volumes. The book will still be a nice, enjoyable read, but will not be as engaging for fulfilling overall due to the lack of prior knowledge. If you have already watched the TV series, then this may well be a good place to start if you were put off of reading the first three volumes as you had already seen the events in animated form. I have not seen the theatrical version of the story, and I am now even more excited to see it after reading the book, but I have to wonder how the movie can have a run time (2 hours, 45 minutes) longer than the amount of time it took me to read the source material. One last thing I want to bring up is that I really like the colorful presentation of the paperback edition of the book, which along with the earlier volumes now has a vibrant little corner on my bookshelf next to some drably presented sci-fi. Barring a few preventable mishaps, Disappearance is a great read and I utterly devoured it during my commute to and from work. I would recommend it to anyone, even if they had never heard of the series or anime as a whole.